The Foxboard is a ready to run embedded system. The board is only 7x7 cm small and contains a "System-on-a-chip" RISC-processor. The Foxboard offers a serial console, two serial ports, a i2c-port, 2 USB-ports and comes with a configured system based (Linux 2.4 kernel and busybox, plus extras like a ssh-clone and a webserver). This little board requires only a 5 Volt 280 mW power-supply. 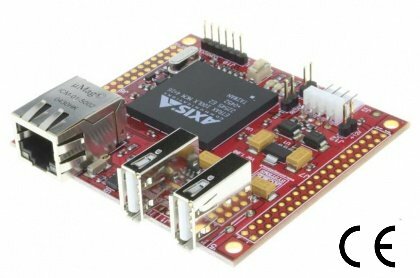 The Foxboard is a small system that can serve as a ready-made platform for prototyping applications, or as the basis of a application-specific Linux-based system and device. Or you can just have plain fun with it. The heart of the Foxboard is a ETRAX 100LX MCM, a chip specially designed to run Linux. The MCM integrates 4MB Flash, 16 MB SDRAM and many more components. The MCM includes enough Flash and RAM for many designs. Yes, you have read that correctly: a whopping 99 bogomips! No Cray-killer, this system. But good enough to be useful and fun.